Well done for reaching your target weight! By following one of our diet plans you've managed to shed the weight you wanted. Don't forget how you feel now, the slimmer, trimmer you. Remember this feeling to help you in the days and months ahead for times when the going may get tough, so that you don't slip back into old habits. If you have been thinking of your weight loss as a journey, you may feel you've now arrived at your destination, but don't forget all the good work you've done on the way. Weight loss is a journey, but this journey doesn't end when you reach your target weight. Maintaining you slim physique takes time and effort too. One of the pitfalls of dieting can be that you only focus on short term weight loss not on what will help you in the long term. Research has shown that people who keep the weight off do so because they learn new habits whilst dieting that they keep when they've reached their target weight. Successful maintainers didn't binge on foods, but were controlled about what they ate. Try hard not to slip back into old ways of eating, and err on the stingy side when putting food on your plate. Try using a smaller plate if you feel that the portion looks mean. It may sound obvious but seems to work for many people. Remember it takes around 20 minutes for your brain to register that your stomach is full, so stop eating before you feel full. Be controlled but do allow yourself small portions of some treat foods, as making some foods completely off limits may make them even more attractive. However if you know you really struggle to control particular foods, do avoid them. You practiced having a meal plan in the Stabilisation phase, so keep up the good work and don't miss meals. You are much more likely to overdo it in the evening if you miss lunch, as you will be tempted to snack. Make a weekly meal plan and shopping list and stick to it as rigidly as you can. If you are planning family meals involve them too, not forgetting to try out new ideas and recipes as you did whilst losing weight.. Even if you get up late and are rushing to work have something to eat. A bowl of cereal with milk is much more nutritious than a croissant and latte which may be all you can buy later in the morning. 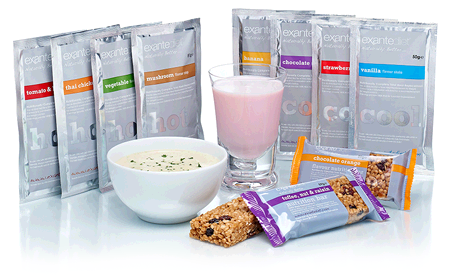 Many long term maintainers will still have an Exante shake for breakfast knowing it supplies vital nutrients and fills them up. Get into the habit of eating breakfast at the weekend as well to keep your eating ordered. Don't let your hard work go to waste. Even gaining a few pounds is worth doing something about, so the weight doesn't pile on again. Don't go into denial! The scales are not lying and the sooner you deal with the added weight the more quickly it will come off. Either increase the amount of exercise you are doing so you burn more calories or reduce your calorie intake. An easy way of doing this is to follow Simple Solution for a few days until you are back at your target weight, then stabilise your weight with the Stabiliser. Learn from the experience so that you can avoid it happening again. When you were losing weight you were encouraged to become more active. Hopefully you will have now incorporated more activity into your lifestyle. Remember being active not only helps burn calories, but improves your muscle tone, heart rate and helps you feel better about yourself too. Activity doesn't just mean going to the gym, as walking, gardening, dancing and even housework all count so whatever activity you've started to do, don't stop now! If you haven't managed to find something you enjoy or can fit into your day, keep trying, because being active is crucial for your overall health. Successful maintainers know what their triggers to eating are, which may be caused by feeling down, bored, lonely, stressed or angry. However they have learned not to use food to defuse these emotions, and can distract themselves by taking a walk, phoning a friend, listening to music or a host of other techniques. Make a diary so you can keep track of your emotions and what makes you consume more than you usually would. Support shouldn't just come from others it needs to come from you too: Set up your household, your day, and your work environment to support you. That means not bringing junk food into the house if you have a weakness for it. It means planning ahead when it comes to snacking and travelling. It means not letting yourself go so long between meals that you find yourself ravenous. It means deciding each day that your weight management is important and to take care of you.